With the functionality below you can do your own calculations and find out what Snowmelter suits you the best. Or, you can use these formulas to do all math yourself. Snow density can vary from fresh dry snow which is roughly 10 lbs per cubic foot to heavy wet snow which is roughly 30 lbs per cubic foot. 2000 lbs (1 short ton of snow) = weight in tons divided into Snowmelter capacity (tons per hour) = hours to melt at a given density at -1 Degrees Celsius. Note: As with all Snowmelters, the ratings drop with temperature below -1 Degrees Celsius because additional heat input is required to heat the snow to the melting point. Trecan Snowmelters are rated at tons of snow per hour at 30Â° degrees F. That is the Snowmelter will melt X amount of tons of pure snow with an incoming snow temperature of 30Â° F. If the incoming snow temperature is -4Â° F, this will result in an additional heat requirement of BTUâ€™s just to raise the temperature of the snow to the melting point. If the nominal capacity of the Snowmelter is to be maintained, then an additional heat input per hour is required. There is no margin in the burners to allow for this extra heat requirement. 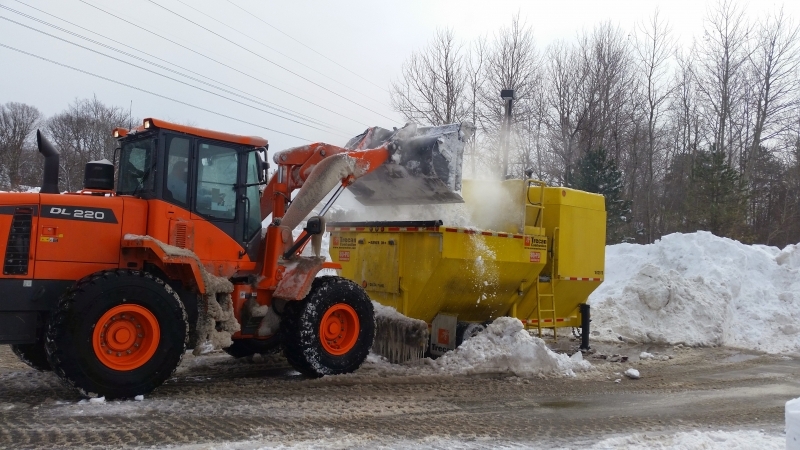 The burners are designed to operate continuously at their rated input, thus any decrease in incoming snow temperature will result in a de-rating of the Snowmelter. The other major factor which will cause a de-rating is ice, the surface area of a quantity of ice compared with snow is very small and the heat transfer rate is lower, such that it will take longer to melt a pound of ice compared with a pound of snow. Trecan Snowmelters use Submerged Combustion Technology, the most efficient and time tested technology available, requiring only 1.5 US Gallons or 6 Litres of diesel to melt 1 – ton of snow.